With the popularity of the Nissan LEAF, the carmaker has shown that it knows how to make successful electric and hybrid cars. 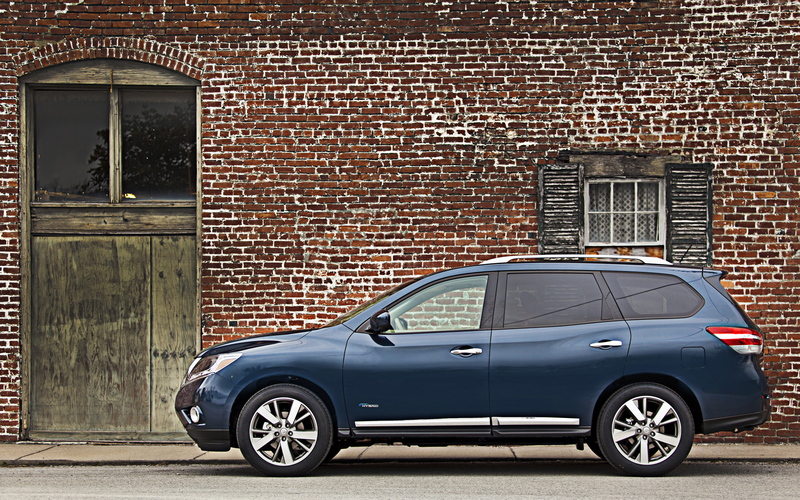 The newest model in Nissan’s hybrid lineup is the 2014 Pathfinder Hybrid. The standard Pathfinder won the Full-Size Crossover Utility Vehicle of Texas at the Texas Truck Rodeo in October. Adding the hybrid option should increase the fuel efficiency by about 25 percent to 25 mpg city/ 28 mpg highway. And, because the battery pack is stored under the third row, you don’t lose any cargo space or leg room. Also added to the Pathfinder Hybrid are unique LED taillights and Nissan PUREDRIVE Hybrid badges. Otherwise, the Hybrid version is visually identical to the standard Pathfinder. Powering the Pathfinder Hybrid is a turbocharged 2.5-liter gasoline engine paired with a 15kW electric motor with a compact lithium-ion battery. Combined, the system is rated at a net 250 horsepower and 243 lb-ft of torque. These systems are joined together with Nissan’s Intelligent Dual Clutch System that controls power from both the gasoline engine and electric motor. Want more information on the 2014 Nissan Pathfinder Hybrid? Give us a call and James Ceranti Nissan – we’ll help you out. Rumors have been circulating lately that Nissan will be adding more of its models to the list of hybrids sometime around 2015. The latest to join the family will be the Rogue and the Murano. In the past, Nissan has shied away from hybrid vehicles, offering only the Altima, which is limited in production. But changes can be expected as Nissan plans to launch a total of 15 electric vehicles by 2016. The Pathfinder Hybrid will go on sale this fall, kicking off these new hybrid endeavors for the automaker. There has also been talk of a different variation of the Altima Hybrid as well. The Pathfinder’s specifications may be mirrored in the release of the new Rogue and Murano, so look forward to a 2.5-liter supercharged engine, and a lithium-ion battery pack. We haven’t heard word on the release date of the Murano, but the 2014 Nissan Rogue will be revealed September 10. Are you excited to see more options available in the Nissan lineup? Until a few years ago, SUVs were not buyers’ first choice because of the heftier price-tag. Small mid-size cars won out. The economy was hard as it was and everyone wanted to save a buck or two. But thanks to the economy bouncing back and a rise in individual pay, SUVs became an option again. Recent trends show a shift away from high-end sedans towards family-size SUVs. Think about it, would you rather drive cross country in a tiny coupe or a spacious 7-seater? Don’t sacrifice style just because you have to tote the kids around, though. The stereotype of minivan-driving soccer mom is waiting to be broken. With three SUVs to choose form, Nissan offers something for everyone. The Pathfinder may be the most common of the three with its bold lines and technology like the Nissan Intelligent Key. 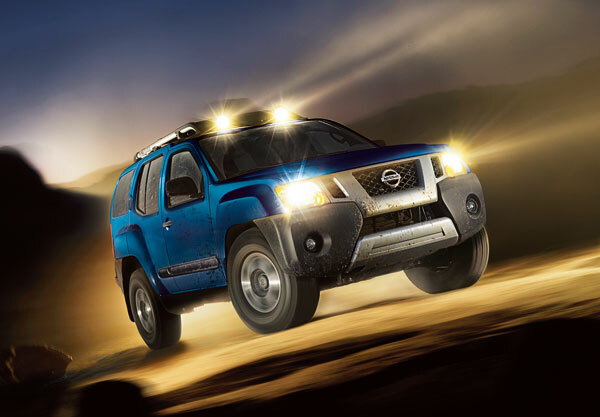 If adventure is calling your name, check out the Xterra. It seats five, has great cargo space and you can buy a hatch tent attachment to make camping a breeze. If elegance is more your style, the Armada is calling your name. Premium comfort and room for 8 mark this as the largest of the Nissan SUV lineup. Keep the kids entertained with dual headrest DVD monitors. SUVs are made for long-distance traveling, made with sturdy bones which also provide top-notch safety for your family. So step up your game and slide into a new 2013 or 2014 Nissan SUV and be the envy of all the playdate circles. The 2014 model year brings many changes to the Nissan family, including the next-generation Rogue, but for the Altima coupe, it’s time to say goodbye. The current generation won buyers over with its clean lines and sharp styling. While it’s unlikely that Nissan will release another coupe, the current one was released about a year after the sedan hit dealerships. New For the 2014 model year are the Versa Note hatchback, the NV200 Compact Cargo van and the next-generation Rogue compact SUV. The Pathfinder hybrid will also be added later in the fall. Several models are also receiving enhancements this year, including the sedan version of the Altima, which now comes standard with the CVT transmission, the Frontier, which gets updated options packs, enhanced navigations functionality, and a sliding rear window. For the latest information on the 2014 models, check back often or come visit us at James Ceranti Nissan for a test drive of the 2014 Versa Note! The 2013 model year has been an exciting one for Nissan. With several models receiving fresh new looks and features, Nissan is ready and able to compete among the best brands in the world, and win! Proof of this can be found on Kelley Blue Book’s recent list of 10 Best Family Cars of 2013. The redesigned 2013 Altima took the ninth spot on the list, while the all-new 2013 Pathfinder beat out every other contender and cinched the number one spot. Both vehicles are now available at our Greenville, MS dealership. 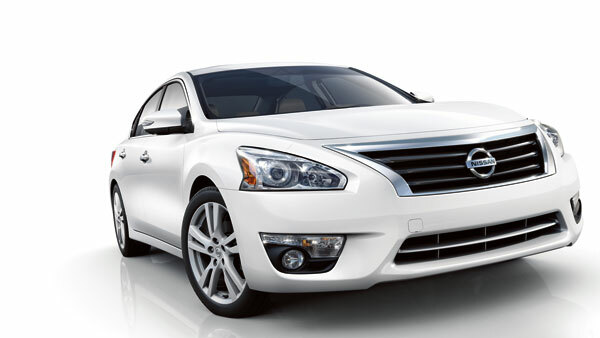 The 2013 Nissan Altima debuted earlier this year with a sharp new look, excellent fuel economy rating, and a comfortable, tech-savvy interior. This five passenger sedan also received excellent safety ratings and an abundance of new safety features including blind-spot monitoring. Needless to say, it is a very worthy contender on this list from Kelley Blue Book. 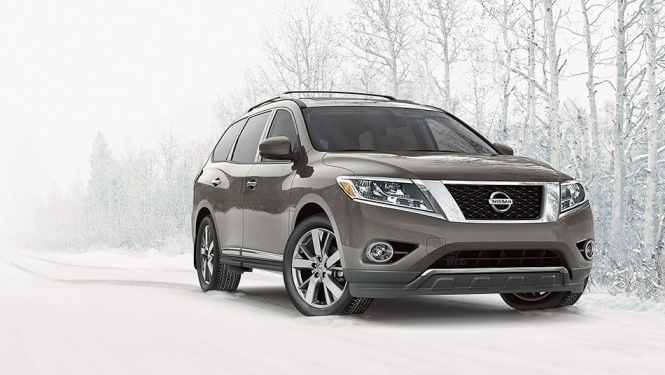 And now on to the champion of this list, the 2013 Nissan Pathfinder! To say Pathfinder was redesigned for this model year is an understatement; this SUV has been completely reinvented. Gone is the boxy, rigid, truck-like styling of previous Pathfinder models and in its place is a smooth yet sporty exterior design that resembles today’s crossover more than an all terrain SUV. Improved fuel economy, better handling, and a more comfortable ride make the new Pathfinder more appealing to families that may have overlooked it in years past. With these updates, Pathfinder is finding its niche now in suburban garages rather than back road trails. For your next family-friendly vehicle, be sure to stop by James Ceranti Nissan. Visit us online to view photos and information of our complete new Nissan inventory, www.jamescerantinissan.net. This holiday season, James Ceranti Nissan is giving away the best present we can—great savings on great vehicles with the Season to Save Event. The sale lasts through the end of November. As far as Nissan’s renowned cars go, the deals range from a variety of cash back options, discounted prices, and low or 0% APR for a series of months. Some of the cars taking part in this Season to Save sales event include the Versa Sedan and Versa Hatchback, the Altima and the Altima Coupe, the Cube, the Maxima, and the Sentra. Crossovers and SUVs are also joining in the savings celebration. With prices the lowest they’ve ever been and low or 0% APR, the deals have never been hotter. Eligible crossovers include the Murano and the Murano CrossCabriolet, the JUKE, and the Rogue. Discounted SUVs are the Xterra, the Armada, and the Pathfinder. Just in time for holiday travel, Nissan’s celebrated minivan, the Quest, is also offered with great savings on price and 0% APR for 36 months, as well as cash back. Interested drivers are encouraged to visit James Ceranti Nissan in Greenville. Visit our dealership online at www.jamescerantinissan.net for complete offer details. 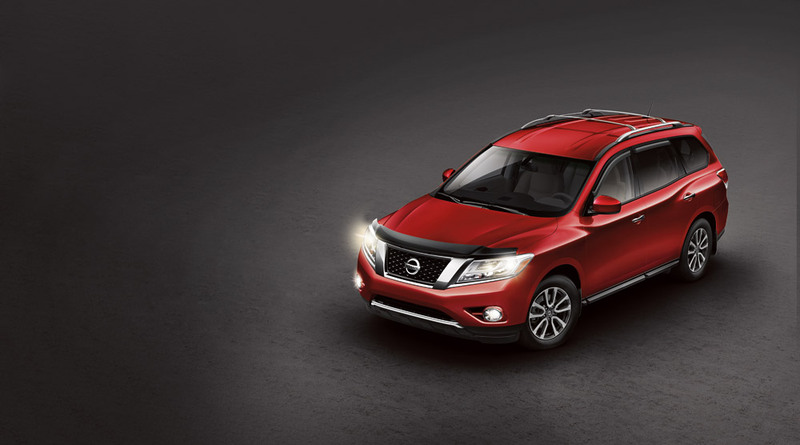 With an array of amenities and best-in-class fuel economy, the 2013 Nissan Pathfinder is the next-generation SUV. The all-new Pathfinder will be arriving at our dealership this fall. 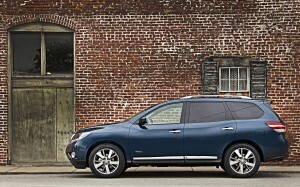 The all-new aerodynamic style of the 2013 Pathfinder’s exterior helped the vehicle shed 500 pounds of mass. Even with this change, the Pathfinder still provides the most interior passenger volume, front headroom, and legroom in its class. The lighter weight also helped improve fuel economy as the 2013 Pathfinder has 30 percent better fuel economy as compared to the 2012 Pathfinder. The FWD version has fuel economy estimations of 20 mpg city, 26 mpg highway, and 22 mpg combined. The 4WD version gets 19 mpg city, 25 mpg highway, and 21 mpg combined. The 2013 Pathfinder can do all that and more, and it will be making its way to James Ceranti Nissan this fall. For more information, visit us online at www.jamescerantinissan.net. Nissan used the 2012 North American International Auto Show as the launch pad to showcase its Nissan Pathfinder Concept vehicle, the next-generation SUV. The concept was a preview of what the 2013 Pathfinder will incorporate. Nissan completely remade the Pathfinder to usher in a new phase in the latest of Nissan SUVs. The styling of the Pathfinder is a bold, dramatic look that had plenty of spectators pumped for the new SUV. “We’ve created a vehicle with an extraordinary balance of SUV capability, thoughtful technology and premium comfort to lead the segment once again,” explained Al Castignetti, vice president and general manager, Nissan Division, Nissan North America, Inc.
Nissan will use the North American International Auto Show as the launch pad to reveal their all-new Pathfinder concept vehicle. The new Pathfinder is ready to make its global debut and show off the brand new design of an iconic Nissan model. Nissan is terming it “The Next Gen SUV”. Engineers took all of the traditional aspects of the Pathfinder and meshed it with Nissan’s newest aerodynamic exterior design and platform. Fans can watch the unveiling of the Pathfinder Concept online as well at www.nissanusa.com. Users can also enjoy visiting the Pathfinder Concept website where they can sign up to get the latest news on the vehicle. We wish the teaser image revealed more but we are excited to see the whole picture of the next generation of Nissan SUVs! Stay tuned for more!